I’ve updated my workshop info because this week I brought home from Seattle a used, brand-new-to-me Woodfast short-bed bowl lathe I’m very excited about. I had to move things around to create a new work station for it, and am planning on making good use of the silver maple bowl blanks I’d stored up. New work coming soon! That is a great machine you will not be disappointed. hope you got it for a good price, have fun. I am jealous (bright green jealous) envious, thrilled for you, in awe of that machine. May you enjoy it eternally and make great stuff for yourself and to share with us..will you adopt me? 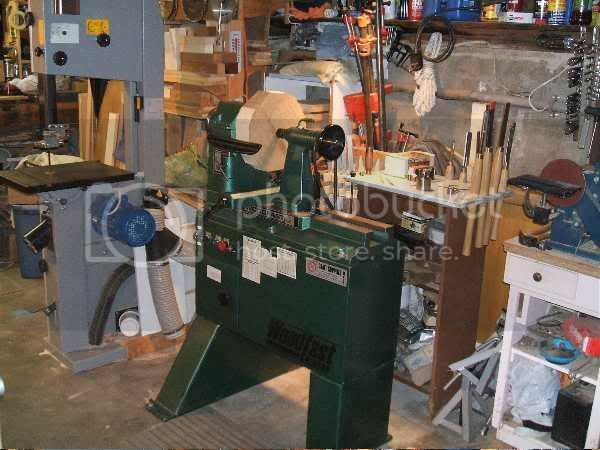 I’m still envious of your bandsaw & drill press!!! That’s a solid looking machine, perfect for spinning bowls. What is the swing on that sweet thing? I would really like to play on something so nice. Look forward to some projects. Oh, that sounds like a dream, Barb! We’ll be expecting big things from you now, both literally and figuratively. :) Be sure to wear your safety gear! My, my it’s a well known turners reject, eh? I think the bowls she creates, may just pop off the lathe without her…wild horses!!!!! may be in your future!!! gulp.. yes, great things are now expected of me by others! But the way I figure it, she started out having to learn her way, just as I am. I’ll get there, maybe not with pyrography, but in some way. The lathe is set for a new adventure. ;-) Yes, wild horses are good, but they’ve definitely been done. And the mind does indeed boggle, mine as well as yours. Take a breath, Michelle. I’m much slower than some others in development; a true ‘late-bloomer.’ I can only get ‘in the Zen of it all’ out in my shop if I am uninterrupted, and that is so rare I can count the events of it on one hand after twenty years! My head is full of ideas. Now if I can only get it to translate through the hands. What a dandy good lathe you have!